The prototype is at the stage of being able to successfully achieve GPS lock, log the received coordinates, waypoints and go to sleep. The power usage of the system needed to be analysed in order to specify the battery requirements. 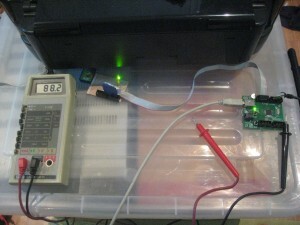 The current draw was monitored after the 3.3V regulator as the device was put into its various modes. The initial measurements showed that the prototype used ~110mA when running and 65mA when suspended with the GPS receiver running. When the SD card was writing a sector the current could peak to 120mA for a short period. Operating for 8 hours a day over a week would require a 3.3V, 13.4Ah battery, which would reduce the portability of the device significantly and be rather expensive. Steps needed to be taken to reduce the power usage. The main loop of the code consisted of an infinite loop, calling functions to process any data that may, or may not be present and consisted of the following code fragment. All of the data in the system arrives via interrupts and no polling is performed so continual looping is not required. The process functions were modified to return a boolean indicating if they needed to continue to process information, ie the button is down and it has to wait for it to be released. The main loop was then modified to put the PIC microcontroller into an idle mode if nothing else had to be done, shown in the code fragment below. By making this change the operating current reduced from 110mA to 90mA, a reduction of 18%. The major current consumer in standby mode was the GPS receiver. Keeping the receiver running while the logger is off enables almost instant startup times as satellite lock is maintained. The SiRF protocol support ‘TricklePower’ modes that reduce its operating time and duty cycle while attempting to maintain lock. These modes were tried, however they only resulted in a reduction in current draw of 15-20mA. If the GPS receiver is used often, it is able to get lock in under 10 minutes from a cold start. For example the logger could be enabled while getting ready for a hike or travelling to the destination so it has achieved lock by the time the user is ready to start hiking. This processes allows the receiver to be switched off entirely, reducing the current draw to almost 0mA. The final power usage calls for a 3.3V, 5.06Ah battery, which is easily obtainable. To put the capacity into perspective, my Nokia 6110 Navigator has a 3.7V, 0.9Ah LiPo battery which would need to be charged at least once a week with minimal usage (2 hours talk tops). This GPS logger is able to continuously operate for 56 hours before needing a charge, much longer than the 6110’s 3.5 hour specified talk time. Now that the requied battery size is known, a suitable rechargeable battery needs to be chosen. Due to space and weight requirements Lead Acid and SLA batteries are excluded and NiCads are ruled out due to better technologies being available. The main contenders for battery types are NiMH and Li-Ion as they are readily available. A large amount of information on battery specification is available in the Electropedia guide on How to Specify Batteries. An average of 6 AA cells, or 2 D cells would weigh the project down and take up a large amount of space. The logger is meant to be as small and light as possible. Li-Ion cells will be used for the logger as they are cheap, readily available and only require 2 cells for 56 hours of operation. A final circuit needs to be designed, allowing for battery charging from USB and voltage monitoring as well as fixing up some errors in the initial circuit. Once the circuit is designed, all components need to be purchased, a case picked and the PCB designed. This entry was posted on March 3, 2010, 10:41 am and is filed under Make. You can follow any responses to this entry through RSS 2.0. You can leave a response, or trackback from your own site.